ENL Wiki » Maximizing Gains » Optimum Scale for the Economy: What Level of Total Outputs? Before addressing an economy's total outputs analytically, it must be introduced as a broader topic in economics. Lumping outputs together has long been a troublesome issue for economic thinkers because it is difficult to measure, or even to properly define, the total quantity of non-homogeneous outputs. Despite longstanding difficulties in this area, ENL is compelled to confront the issue because it must be able to compare the effects of various economic changes relating to the economy as a whole. There is no problem in quantifying relative changes to a specific output mix. If an economy produces 5 bicycles and 100 pomegranates, and this mix increases to 10 bicycles and 200 pomegranates, it can be coherently stated that the economy's size has doubled. But what can be said if the output proportions change, and the new mix includes 10 bicycles and 150 pomegranates? Worse, what if the mix itself changes, and the economy now produces 8 bicycles, 75 pomegranates, and 50 pounds of carrots? In such cases it is impossible to quantify the changes in an economy's size unless we have a unit of measurement that is common to all outputs. Standard economics solves this problem by expressing all outputs in monetary terms. This allows its practitioners to talk about increases and decreases in an economy's output level by citing changes in its GDP. Because ENL is deeply concerned about an economy's effects on people and planet, it cannot solve this problem in such a facile manner. However, ENL's rejection of this radical abstraction also means that it rejects a universal measurement unit. Consequently, whenever ENL talks about an increase or decrease in an economy's total outputs, it must assume that the output mix remains largely unchanged. When plotting total outputs, therefore, the current output quantity on the horizontal axis refers to the present mix of outputs, at their present quantities. Moving left or right on this axis indicates that the mix becomes smaller or larger, but that its composition remains substantially unaltered. The precise meaning of "substantially" must be left to the analyst's judgment. If the output mix does change in this manner, ENL treats the new mix as a qualitatively different set of outputs. This necessitates a new graph and a new starting point for analyzing economic changes. For this reason, all ENL graphs that deal with total outputs assume that the output mix is relatively stable. One further note on terminology is required at this point: In order to avoid confusion with GDP growth and shrinkage in standard thought, and with ecological expansion and contraction in environmental thought, changes in the size of the current output mix are referred to as increases and decreases in the economy’s scale. This term is consistent with ecological economics, which has long used "scale" to refer to an economy's size. With the above considerations in mind, we can apply ENL's optimization analysis to an economy's total outputs. See the following figure. In ENL, an economy’s scale refers to its size based on the current output mix. Without reducing all outputs to money, it is impossible to compare the “sizes” of economies that have substantially different output mixes. To create this graph, the first step is to sum the marginal values and costs for all outputs in the current output mix. These sums are placed on the vertical line that represents the current quantity Q. The curves are then drawn based on estimates of the changes in these summed values and costs as the economy's scale increases and decreases. 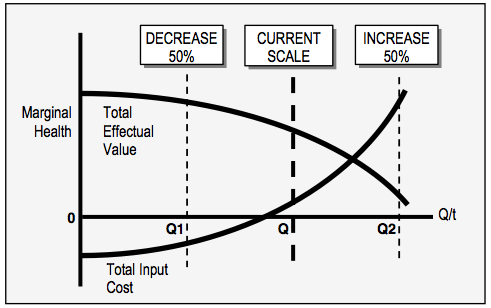 In the example shown, output level Q2 represents a 50% increase in the economy's scale, whereas output level Q1 represents a 50% decrease. For a concrete example, assume that the economy currently produces 12 bicycles and 50 pizzas a week. This is output level Q. Level Q1 would then represent 6 bicycles and 25 pizzas a week, while level Q2 would represent 18 bicycles and 75 pizzas a week. 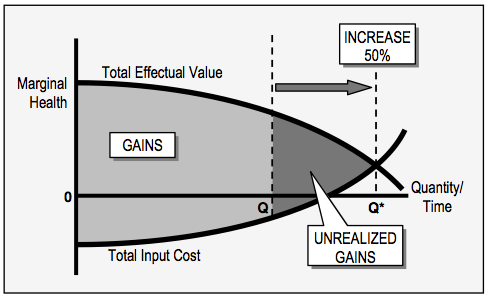 The graph thus shows the value and cost results of increasing or decreasing the quantity of all outputs in an economy by the same proportions. Although this is obviously simplistic with respect to a real economy, it is a useful starting point for the systematic treatment of total outputs and their effects on health. Based on the above, optimizing an economy's scale means finding the health-maximizing level for the current output mix. An example is shown in the foloowing figure. An economy’s scale is optimized by treating its current output mix as a single aggregate output and then applying the previous optimization method. This approach ignores individual outputs, and therefore does not necessarily maximize health. In this graph the current economic scale should be increased by roughly 50% in order to reach the optimum level Q*, thereby maximizing the gains for the population served by this economy. If the current quantity is greater than the optimum quantity, the economy's scale should be decreased instead. Increasing an economy's scale is both different from and similar to the standard concept of economic growth. The major difference is that economic growth, because it is measured by money, can result in either a higher or a lower level of overall health. Increased scale, on the other hand, will always result in a higher level of health until the optimum total quantity is reached. The key similarity is that both concepts refer to a general increase in outputs, without paying attention to the specific effect of each individual output. For ENL, this lack of discrimination means that increased scale (up to the optimum quantity) is an economic improvement, but is very unlikely to be the best improvement. In order to achieve the best possible results, each output must be treated independently, and its quantity must increase or decrease according to the optimization analysis. An important aspect of ENL's treatment of total outputs is that the framework is blind to the monetary "size" of an economy. This should be obvious, but it can lead to superficially bizarre results. For example, the US economy has a total GDP of $14 trillion and a per capita GDP of $46,000. The comparable figures for Samoa are $1.2 billion and $2,100. By every standard measure, the US economy is overwhelmingly larger than Samoa's. Nevertheless, ENL attaches no meaning to such comparisons because the output mixes of the two economies are strikingly different. Thus, the US economy cannot be scaled down to Samoa's, and Samoa's economy cannot be scaled up to that of the US. The health effects of the two economies are completely distinct, and their sizes are therefore incommensurable. This counterintuitive conclusion might make more sense when seen from the health perspective. Assume, for instance, that $45,000 out of the $46,000 annually available (on average) to each US citizen is spent in a manner that generates zero or negative health results. Assume further that $2,000 out of the $2,100 available to each Samoan is spent so as to generate positive health results. If this were the case, Samoans would be healthier than Americans, and in this sense their economy would be "larger". While this example is entirely hypothetical, it demonstrates that monetary comparisons are logically irrelevant for a guiding logic based on the objective standard of physical health. 1. Quoted in Nicholas Georgescu-Roegen, The Entropy Law and the Economic Process (Cambridge: Harvard University Press, 1971), 98. 2. Of course, under capitalist conditions, economic growth is critical for workers because they rely on employment income to earn a living, and their employment is often tied to rising GDP. The discussion here is conceptual, and therefore ignores the concrete capitalist realities.